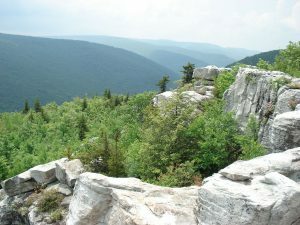 The Dolly Sods Wilderness area is located in eastern West Virginia. The area is in the Monongahela National Forest in the Allegheny Mountains. The area contains some incredible sweeping vistas and the terrain is very rocky and mostly high-altitude plateau reminiscent of geology found in Canada. In the northern part of the wilderness, the landscape is very distinctive and features wind-carved boulders, stunted trees, grassy meadows and heath barrens. Much of this landscape was created as a result of fires and logging, along with very old sphagnum bogs. The southern part of the wilderness features a dense cove forest. The North Fork of Red Creek also runs through a branched cavern. The name of this wilderness area comes from the Dahles, a German homesteading family, along with sods which is the local name for mountaintop meadows. The Dolly Sods has almost 18,000 acres. The lower elevations consist of laurel thickets and northern hardwoods. In the higher elevations, there are heath barrens where mountain laurels, azaleas, blueberries and rhododendron grow. The landscape also features groves of red spruce stunted by the wind. There are many old sphagnum bogs where cranberries, moss, and sundew plants grow. Visitors to the Wilderness can also see beaver ponds and walk more than 50 miles of trails. Most of these follow old logging roads and railroad grades. The higher elevation of the Dolly Sods causes a cool climate and the wildlife is similar to that found in Canada. Also here are snowshoe hare, beaver, bobcats, foxes, black bear, timber rattlers, groundhogs, grouse and wild turkey. In the 1930s, white-tailed deer were re-introduced into the wilderness and are once again abundant. Visitors to this wilderness area should leave no trace of their visit. While camping is allowed, it is carefully monitored to prevent damage to the environment. No live vegetation may be cut and no off-road vehicles are allowed in the area.